176 pages | 5 B/W Illus. With featuring far-reaching diversities and disparities among the regional states in their political, economic and social systems and cultural and religious orientations, East Asia is a microcosm of international society at large. Nevertheless, there are unique dynamics unfolding in East Asia at the turn of the twenty-first century, namely the rise of China as a contender for regional and global hegemony and a set of collective initiatives to integrate the region into a harmonious community. This book provides new arguments on China’s rise and the transformation of East Asia and analyzes the foreign policy behavior of the regional states and relations among them. In doing so, the contributors show why and how China is rising, and how China’s rise shapes the emerging regional structures and institutions in East Asia. 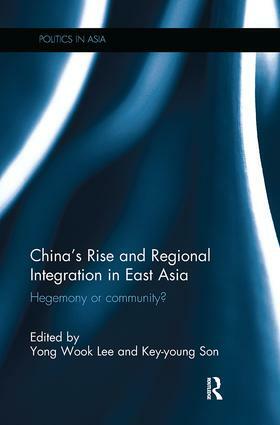 Furthermore, given the East Asian context where the world’s second and third largest economies coexist with much smaller states and with China’s ascendency likely to continue, this book challenges the pervasive dichotomy of hegemony and community. This allows for a fuller and more nuanced account of China’s role and the shifting regional policies in East Asia in which hegemonic cooperation does not necessarily lead to a hegemonic form of regional order. Presenting strategic, political, economic and historical perspectives on China’s changing role in the region and the development of regionalism, China’s Rise and Regional Integration in East Asia will be of great interest to students and scholars of Chinese politics, Asian politics, international relations and regionalism. "Because their analytical perspective is rooted more in the long term view of East Asian integration, it is not difficult to apply their principles and assertions to the somewhat altered circumstances that are in place today and those that will be in place in the near-term future. The chapters are appropriate for specialists, graduate students and, in some cases, advanced undergraduates." Yong Wook Lee is Associate Professor in the Department of Politics and International Relations at Korea University, Korea. Key-young Son is HK Research Professor in the Asiatic Research Institute at Korea University, Korea. Politics in Asia has long been established as a source of distinctive and authoritative studies on the political life of Asia. The series covers a broad range of countries and aspects of politics, and includes volumes from some of the leading scholars working in the field.